TATS A KOOL CHALLENGE: Giving Hope a Try! 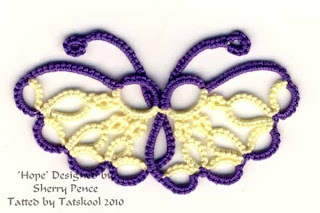 Did ya see the post by Tatting Goddess?? She had just started a blogging sabbatical when she was dragged back by a piece of thread! 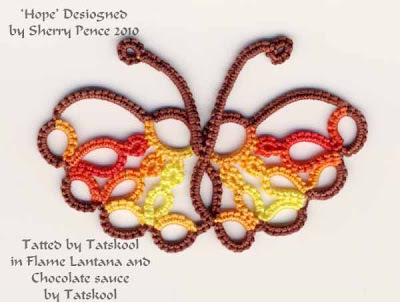 I innocently sent her a little card of Flame Lantana (as you do! ), little thinking what it would spark off in her mind. She obviously knows far too much about Tequila Sunrise and what it can do!! I must admit that I have never seen a Tequila Sunrise before, she is spot on with the colour. So do go and look at her post and see the stunning earrings that she tatted...just goes to show what you can do with 10 yards of thread. It's worth going over there just to see the video clips, it's all sure to brighten your day. "I was VERY surprised at the way it tatted up. On the card, the colors look so bright and you miss that gradual change in shades. As I moved on to the 2nd half of the first earring and saw how the colors played out, it really did remind me of that drink, tequila sunrise, how it's all different layers and then you stir it and it's so pretty as the colors blend. I wondered also if the 2nd earring would follow the same course so that they matched or if it would be off a bit but they match". Don't you just love it when a length of thread tats up relatively symmetrically without having to engineer it. Now back to serious stuff! 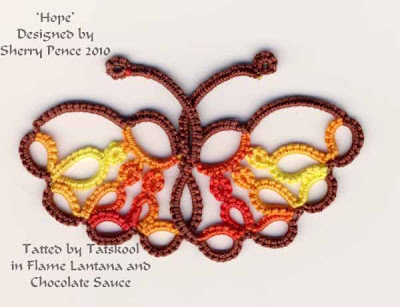 She says that 'Hope was designed for my fellow tatters as a symbol of the threads that bibd us together and a reminder that we are not alone'. I have to admit that I am not a great fan of butterflies....even tho' I tat Jane Eborall's SCMR tiny butterfly almost every day. It must be because as a zoologist a butterfly needs to look like a butterfly. I am trying to unburden myself from this rigidity...honest. Every now and then a butterfly comes along which lights my fire and this was one of those. This is my first attempt using two shades of Flora 20. Now this one really doesn't look quite right. I did have problems with the lock join that takes me from the first wing to the second and from the second wing on to the antennae to finish. I couldn't get my threads to come out of the lock joins facing in the right direction. IsDihara had said that Flame Lantana reminded her of a Monarch Butterfly so I just had to try it on Hope. Chocolate Sauce shouted pick me for the outer colour and it was a WOW!! 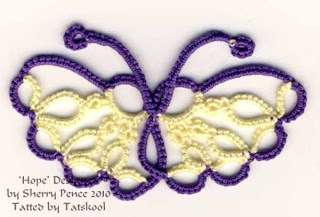 It's always a surprise tatting anything new in HDT ...it's so much part of the fun. Sometimes they look great sometimes they are a disappointment...particularly for me with commercial threads which look so nice on the ball. 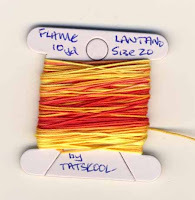 HDT twisted into a skein shows all the beautiful colour changes, wound onto a thread holder/card it looks like a mish mash of colours and you wonder what it will look like when it is tatted up. Flame Lantana tatted up in Hope beyond my expectations as the colours on the two wings are almost the same. After some discussion with LadyShuttleMaker about those troublesome lock joins and her explanation that each side should look the same with the wings folding behind each other and one antenna on each side.....not both coming from the front as mine are doing. That's super too. I love this colour combination. Much better. But I did get a bit muddled so this one is neither front nor back as I have little bits of colour showing on the joins on both sides. Determined to get it right..one more go! using my SweetShop and Rose.. I did do one more but made a major mistake that I only noticed when blocking...one side had 4 outer rings, the other only 3 ooops....and it looked so pretty too. I love all the butterflies you made! 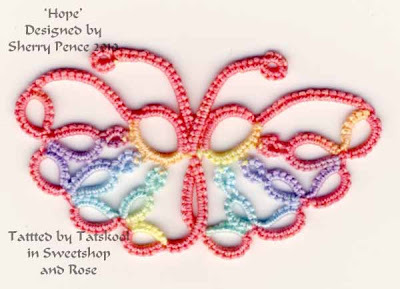 I am really enjoying seeing all the different colors that people are tatting Hope in. My favorite so far is yours in SweetShop and Rose. The color is so soft, it's just lovely!! It's hard to pick a favorite, but I have to say...the last one is "spot on"!!!! Love the colours and the buterfly's look great. I also made Sherry's Hope and found it a challenge!!!! Thanks everybody, just made another one and I think I have got it! !, Show you tomorrow. It's having a holiday! Coming soon in another butterfly! As usual, love the colours of your tatting, all are so sweet! Sweetshop and Rose is lovely - so is lantana! There are huge bushes of lantana growing all along the road here, and every so often the Council comes along to spray them - they get out of control so quickly. It's much prettier in a butterfly! 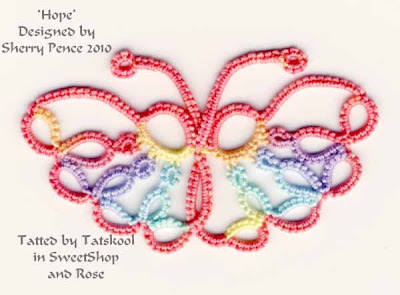 You know, I'm normally now a huge fan of pink, because it can look so syrupy sweet, but your Hope butterfly tatted in Sweet Shop and Rose is so cheery! All the lepidopteras (my big word for today!) are a delight, especially the very Monarch-like Flame Lantana and Chocolate, but Sweet Shop and Rose just fluttered away with my heart. Thanks Singtatter, Maureen and IsDihara, so glad you like the colours....I could have done dozens in every colourway that i could think of but had to stop.....well now i have done even more...its too addictive.